YES Montreal implements IgnitionWeb to provide better events promotion, communication and online self-service capabilities for its clients. 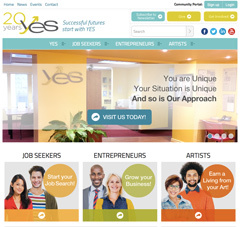 YES is a non-profit, community organization that delivers English-language job-search and self-employment services to Quebecers. YES wanted to better promote the range of services offered to their clientele, while maintaining simple navigation and information architecture. HTC created a vibrant, “youthful” layout designed to attract interest from their three target audiences: Job Seekers, Entrepreneurs and Artists. Combining email and website promotional tools advertising their wide range of services will attract more registrants to YES Montreal and their many events and activities. Administration Manager, Media Centre, Mailing List Manager, Promotions Manager, Library Manager, News Manager, Calendar Manager, Careers Manager, EasyText Editor, Search Tools, and Site Statistics. Adapted Careers Manager to allow outside employers to post job openings online, that are then managed, approved, and activated by YES personnel. Mentorship Manager and Resources Manager. 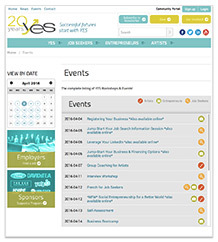 YES has experienced a marked increase in Conference and course enrolment, email newsletter subscriptions and online job postings. The new website has helped YES better serve clients by delegating site and content maintenance tasks to the various departments responsible, thus eliminating the information bottleneck that plagued previous communications efforts.